The Sycamore tree, of the genus Platanus, is familiar to all of us, with its peeling, “camouflage” bark, very large size, and an ability to grow and survive almost anywhere. The native sycamore, Platanus occidentalis, is known as the American Planetree, Buttonwood, and Buttonball Tree. 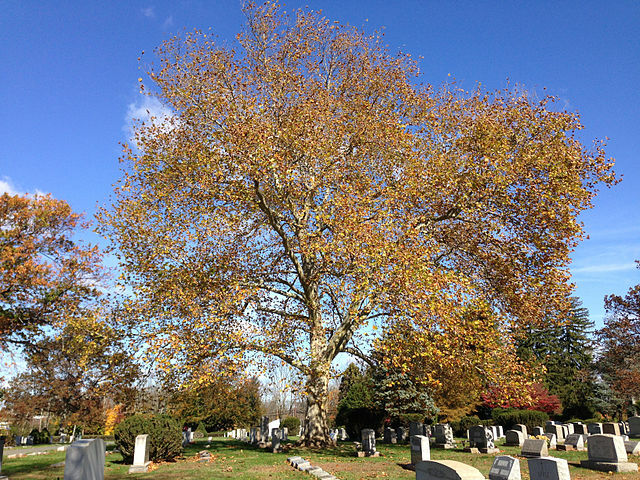 The Ewing cemetery on Scotch Road has some very large and handsome American Planetrees. Platanus x acerifolia, a hybrid first recognized in London, England around 1663, is known as the London Planetree, and grows today throughout the United States and Europe. The terms of the New York Stock Exchange are called “The Buttonwood Agreement” because they were signed under a sycamore tree at 68 Wall Street NYC, in 1793. These trees are hardy from USDA Zones 4 through 9 (Ewing is 6B), ranging from Ontario and Maine south to Florida and west to Nebraska and Texas. They are very tolerant of air pollution, smoke, grime, and acid or alkaline soils. In nature they are found along rivers and streams, bottomlands, and deep, rich, moist soils. They prefer full sun. Sycamores easily reach 75’ to 100’ in height and have a similar or greater spread. They can grow to more than 150’ tall, making them one of the tallest eastern native trees. The sycamore habit is pyramidal in youth, becoming open, wide and spreading at maturity with very large branches and massive trunks. George Washington is said to have recorded one sycamore which had a trunk diameter of 44’ at the confluence of the Kanawha and Ohio rivers. The lobed, palmate leaves are arranged alternately on the branches and measure 6-7” long x 8-10” wide. The leaves are yellow-green above and paler below. The fall color is brown to yellow-brown. The mottled bark is dark, reddish-brown, smoother and lighter colored higher in the tree; the rigid outer layer bark tissue, unlike that of most other trees, cannot stretch, so it splits, flaking off, exposing the lighter bark beneath. This feature, with the trees’ coarse texture and crooked branches, makes the sycamore very easy to identify and imparts a beautiful winter interest. The flowers appear in dense heads in May, but are regarded as insignificant. The fruit, however, is a 1” diameter prickly, brownish ball, evident in October and persisting into winter. Sycamore wood is hard, coarse grained, tough, and difficult to work. It is used to make butcher’s blocks, crates, boxes, furniture, siding, and musical instruments. The list of sycamore pests and diseases is a long one. The most troublesome is Anthracnose disease, a fungus which wilts leaves in early spring, and causes the mature leaves to turn brown, shrivel and fall in the summer. The compromised tree may eventually die from the effects on its vascular system. For this reason, the London Plane Tree, Platanus x acerifolia, has become very popular as it seems to resist the anthracnose fungus. In other respects the London Planetree is very similar to the American Sycamore. Sycamores tend to be messy, with their constantly dropping leaves, twigs and prickly fruit. They are too large and messy to use as a street tree or as a lawn tree, and are best on large campuses, golf courses and parks. They have been used successfully as large hedges and along alleés. Unfortunately, many sycamores were planted as street trees years ago and now must be severely pruned – and misshapen- to make way for overhead utility lines. They are easy to transplant when young and as mentioned earlier, are not very particular about soils and pollution.